From the Nordic noir duo who brought you "The New York Times" bestseller "The Boy in the Suitcase "comes a chilling new thriller with a mystery seventy-years in the making. Natasha Doroshenko, a Ukrainian woman who has been convicted for the attempted murder of her Danish ex-fiance, escapes police custody on her way to an interrogation in Copenhagen's police headquarters. That same night, the ex-fiance's frozen, tortured body is found in a car. It isn t the first time the young Ukrainian woman has lost a partner to violent ends: her first husband was murdered three years earlier in Kiev in the same manner. Danish Red Cross nurse Nina Borg has followed Natasha's case for years now, ever since Natasha first took refuge at her crisis center. Nina just can t see the young mother as a vicious killer. But in her effort to protect Natasha's daughter and discover the truth, Nina realizes there is much she didn t know about Natasha and her past. The mystery has long and bloody roots, going back to a terrible famine that devastated Stalinist Ukraine in 1934, when a ten-year-old girl with the voice of a nightingale sang her family into shallow graves. Lene Kaaberbol and Agnete Friis are the Danish duo behind the Nina Borg series. Friis is a journalist by training, while Kaaberbol has been a professional writer since the age of fifteen, with more than two million books sold worldwide. Their first collaboration, "The Boy in the Suitcase," was a "New York Times" and "USA Today" bestseller, has been translated into thirty languages, and has sold half a million copies worldwide." "[Nina] joins the sisterhood of run-amok heroines like Homeland's Carrie Mathison and Lisbeth Salander of The Girl with the Dragon Tattoo. Nina doesn't just have a bee in her bonnet — she has a whole hive. And it's buzzing away in her latest adventure, Death of a Nightingale, an elaborately plotted page-turner that flits from today's liberal-minded Denmark and mobbed-up Ukraine to the starvation-racked Soviet Union of the Stalinist '30s." 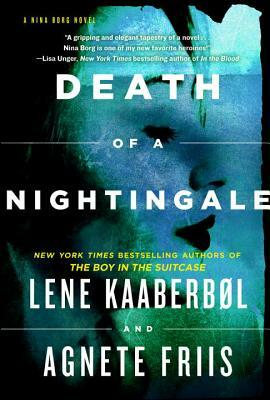 "Death of a Nightingale is a gripping and elegant tapestry of a novel. A seamless weaving of psychological depth and rocket-paced plotting, the story hooked me in and the strong, complicated, and fascinating women at its center kept me utterly riveted cover-to-cover. Nina Borg is one of my new favorite heroines!" "Feminist outrage fuels the politically pointed novels of the Danish writing partners Lene Kaaberbol and Agnete Friis....Nina is all heart and her efforts to bring justice to women like Natasha are heroic." "A moving story... [Kaaberbol and Friis] tell a socially conscious—and, at times, critical—tale about immigration issues that apply both to Denmark and the U.S. without sacrificing the urgency of the best thrillers." "Required reading for fans of the burgeoning field of new Nordic suspense." "There are two parallel stories told in this exciting mystery. The main story is about a beautiful young Russian woman, Natasha, accused by the Ukrainian authorities of murdering her husband. She manages to escape with her young daughter to Denmark. Subsequently she is sent to a Danish prison for the murder of her fiancée. There are many clues that seem to demonstrate her innocence, but someone prefers that the truth be left unknown. The second story line takes place around 1934 when Stalin was in power. Oxana, also called the nightingale of the people, and her younger sister Olga are featured. The dreadful circumstances of their lives have tentacles that reach far into the future, and collide with the fate of Natasha and her daughter. The mystery builds and builds in intensity until it is almost impossible to put the book down." "Artfully drawn characters who are a pleasure to know populate Kaaberbøl and Friis’s excellent third thriller featuring nurse Nina Borg... Woven in with the present-day narrative are scenes from 1934 Ukraine, where two sisters are starving in a nightmare childhood. The stories eventually link up, of course, with one final clever twist." "Nina is an imperfect hero, which makes her all the more appealing." "[The] latest Nina Borg mystery grips... A sense of mystery and threat looms large over the gloomy, ice-bound landscape." "The authors follow their 2011 Nordic noir hit The Boy in the Suitcase with this intense murder mystery, once again starring Danish Red Cross nurse Nina Borg. Intricate, compelling and dark." "Explores a different kind of trauma, with deep, twisting roots in the forced famine of Stalin in Eastern Europe of the 1930s... This well-crafted book takes us to the inevitable conclusion that, while life can go on after the worst of the worst, the past is always with us." "Scandinavian Crime Aficionados will love this chilling modern thriller." "Readers who like historical fiction will nonetheless find themselves intrigued by the emotionally resonant portrayal of the sisters growing up in extraordinary times, and readers who like thrillers that touch on women’s issues will appreciate the sketches of two women, one determined to save her child at any cost, the other obsessed with saving the world one person at a time." "Fans of the duo's previous books will not be disappointed." "The Danish duo just keeps getting better... [Death of a Nightingale] is near perfect." "One police character in Death of a Nightingale describes Nina Borg as “hostile to authority and borderline paranoid.” That’s one way of looking at our Nina’s heroism." "Once again, Lene Kaaberbøl and Agnete Friis have constructed an emotional roller coaster ride peopled by characters of marvelous depth and nuance." "Kaaberbøl and Friis have served up a complex, compelling mystery, one that is filled with fascinating characters, provocative themes, and plenty of pulse-pounding action." "Kaaberbøl and Friis are among the very best writers in the current crop of Scandinavian crime writers." "Ultimately a story of families torn apart, both in the present and in the past... A welcome addition to an already outstanding panoply of Scandinavian crime novels." "This is the third in the Nina Borg series, and this latest title certainly caters to the mystery (and slightly gory) reader.... Readers will discover the reason for the gory fable at the beginning, and by the end of the book, they’ll be cheering." "How can I put this? It seems wrong to say it’s entertaining or a pleasure to read, because it will make you sad and angry and ache with sympathy. Yet it’s a story that you will care about and the plot will propel you forward. Perhaps the most accurate words for it are “thrilling” and “unforgettable.” It’s a very good book." "The contemporary story alternates with a riveting account of life in Ukraine in the 1930s, first during the famine and the campaign against the kulaks... Two little girls are at the center of this story, one eight, the other ten. What they did as children and what was done to them is still reverberating seventy years on." "Loved this... A terrific story of how the past can continue on and spread its tentacles into the future." "A stunning indictment of all that was wrong with Stalinist Russia...[and] a story that will leave the reader on the edge of the seat until the end." "Suspense that captivates you and characters that quickly become much more than just clever constructions." "Incredibly well written with both an original and suspenseful plot." "Elegantly told and thankfully completely without any of the normal clichés that otherwise rule the genre. A really well composed thriller."